Ballast tanks in cargo ships offer a convenient transportation system for marine non-native species. They can hitch a free ride from port to port and get dropped off in foreign waters when the tanks are flushed out. In their new environment, some species live unnoticed for years, and sometimes remain undiscovered by scientists. Others, for largely unknown reasons, become invasive and troublesome, multiplying so quickly that they push out native species from habitat and food sources or cause damage. Mussels from the Caspian Sea, for example, have infested the Great Lakes, clogging water intake facilities of power plants and water treatment facilities. 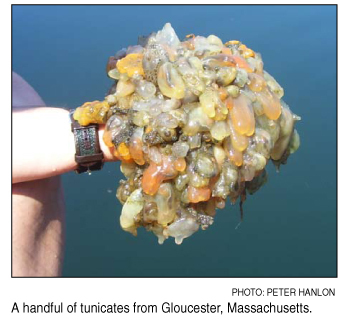 The sea squirt, Didemnum sp., is invading the seabed of Georges Bank in the Gulf of Maine, crowding out scallops and blocking fish from the seabed worms they eat. Scientists have known about the invaders for decades. But finding a way to slow that unwelcome traffic has been more difficult, said Judith Pederson, coastal resources specialist in the MIT Sea Grant College Program. As global shipping has increased, so have the incidents of invasive species. The correlation is not entirely clear cut, said Pederson, who has spent years tracking invasive species in the Gulf of Maine. Awareness of non-native species by scientists and others also has increased in recent years, she said. Australia and New Zealand have taken leadership roles in preventing, managing and, if possible, eradicating invasive species. The United States requires ships to flush out ballast tanks at sea, reducing the possibility that foreign bodies will make it to coastal waters. But international standards for how much bacteria, phytoplankton, zooplankton and other organisms per one cubic meter (1.3 cubic yards) of ballast water countries will allow have been slow to emerge. “To kill everything in the tank is an overwhelming process,” Pederson said. There are many considerations, including how many creatures are allowed to come through and how to measure them. Species like plankton tend to aggregate, so it is possible for a measurement to be taken in a part of the tank where they are not present. Sampling tanks is complicated by the lack of easy access, size and internal structures. So decisions about where in the tank to take measurements must be considered carefully. One added element is cost. The expense of flushing tanks and measuring the number of live organisms that are left is significant because of the number of samples that need to be taken and then identified. She added that no one has fully gauged the cost of dealing with invasive species once they arrive and get established. “But if we can prevent a species from coming in, we won’t have to face sustained costs to contain them,” she said, adding that estimates range from hundreds of millions of dollars to $1 billion dollars to manage the Zebra mussels (Dreissena polymorpha) in the Great Lakes, throughout the Mississippi watershed and in the west. “We need to push for economic studies” to bring the social and economic components together in such a way that catches the attention of regulators, according to Pederson. Prevention is the major focus of cost savings, she emphasized. “By preventing something you’ve saved yourself a lot of time and money that is needed to redress damage from the invaders.” She again cited the uninvited Zebra mussel, best known for clogging pipes and water intakes. Every year the Chicago water authorities have to close down sections of water pipes to clear out the mussels, despite an extensive system of filters to prevent their entering the system. Pederson’s interest in with invasive species began in graduate school. While she was fascinated by nature since childhood, she grew up away from the ocean, in Johnstown, Pennsylvania. Nonetheless, she developed an interest in and passion for biology and marine ecology. Her skills were honed in graduate school, when she spent a summer taking the Invertebrate Zoology Course at the Marine Biological Laboratory in Woods Hole, Massachusetts. “When I arrived in Woods Hole on a beautiful sunny day in early June, I found my nirvana,” she said. Several years later, when she was a summer fellow at the Woods Hole Oceanographic Institution (WHOI), she met James Carlton, now an invasive species expert and professor of marine sciences at Williams College in Williamstown, Massachusetts. 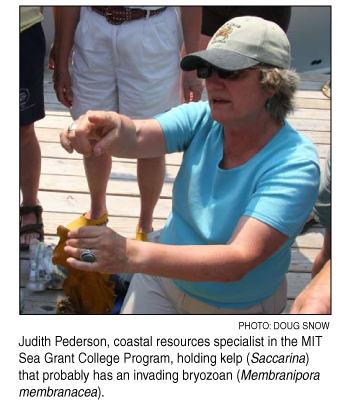 At the time Pederson met Carlton at WHOI, he was a postdoctoral fellow who introduced her to marine bioinvasions. “He pointed out that two of the animals I had studied for my doctoral thesis were non-native species, the snail Littorina littorea and the green crab Carcinus maenas. Both play a major role in structuring the intertidal and nearshore communities. Alas, this was not in my thesis,” she said. To push the prevention strategy, Pederson and fellow researchers at the Northeast Sea Grant College Programs are working to get the public more involved in identifying potential invasive species in the Gulf of Maine. Divers already are switched on to this idea, she said, but citizens doing water-quality monitoring, for instance, could also be trained to look for anything unusual. One outreach effort focuses on reminding the public to not release bait and packing material into the water, to keep their hulls clean so they do not carry plants and animals to another location, and to not discard live seafood or shells into the water. MIT Sea Grant is launching the Northeast Marine Invasive Species Web site with such information available to the public. In addition to these efforts, MIT Sea Grant has developed a regional invader database, the Marine Invader Monitoring and Tracking System (MITIS), that serves several regional monitoring groups. These include citizens throughout the Gulf of Maine who report findings using the Hitchhiker Guide to Exotic Species; divers from Maine, New Hampshire and Massachusetts; the Salem Sound Coast Watch; Massachusetts Coastal Zone Management; and the North South River Watershed citizen monitoring programs. The citizen monitoring programs take data over most of the year and develop long term records, so they are most likely to see and report new species, Pederson said. This early detection may lead to a rapid response approach to eradicate or minimize the effects of an invader. If someone sees a snail, Pederson said, and they recognize it is not native and inform the authorities in that area, the Gulf of Maine states and provinces may organize a team of people to take care of it. “Sometimes you can have success on these very localized populations,” she said. Didemnum appears to have no natural predators, which may explain the wide swath of ocean floor it now claims. 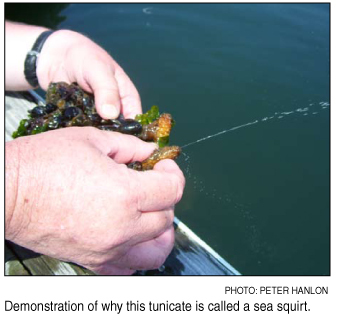 The sea squirt’s toxic compounds and low pH make it nutritionally unattractive. Almost nothing will eat it, Pederson said. And nothing appears to grow on it. She ventured that the Didemnum may be preventing scallops from settling and growing and that it also could be preventing juvenile fin fish from feeding on worms in the gravel. This summer Pederson hopes to get more information when the MIT Sea Grant program sends an autonomous underwater vehicle to take photos and acoustic imagery with a Dual Frequency Identification Sonar (DIDSON), a type of ultrasound that enables researchers to see soft tissue on the hard bottom. This effort will be a step toward further mapping its distribution in Georges Bank, Pederson said, with the long-term goal of documenting impacts. The U.S. Geological Survey and WHOI also are conducting surveys. Their initial studies were to look at benthic organisms. The USGS and the University of Rhode Island found Didemnum, as did WHOI when it was looking for scallops. “We are testing new equipment to cover more area in a shorter period of time,” said Pederson, who is a co-principal investigator on the project. One measure of the sea squirt’s aggressiveness is the difficulty other states and countries have had in trying to eradicate it. California failed, she said, as did New Zealand after trying several approaches. She said researchers wrapped 150 piers that were up to 70 feet (20 meters) long in black plastic and tape to smother the sea squirts underneath, only to discover that the tiny fragments that survived at the bottom regrew, and within a year covered the piling. Another effort involved a large barge that they vacuumed clean of sea squirts, again only to see them return in greater numbers. Their final solution: Take the barge out to one of the deep sounds and sink it by blowing it up. As drastic as that sounds, the Didemnum’s tenacity appears to be in a league of its own. Said Pederson, “It’s one of the most aggressive invaders that I know of. Pederson is Chair of the International Council for the Exploration of the Seas Working Group on Introductions and Transfers of Marine Organisms and has organized several biennial International Marine Bioinvasions Conferences.